Everyone wants fresh, beautiful, exfoliated skin from head to toe. Sure, you could spend lots of time and money going to the salon every day or a spa to get that full-body exfoliating scrub, complete with scented oils and fancy European bath salts, but who can afford that other than the rich and famous? Well, the good news is that you don't have to be rich or famous to look like you get a glamorous spa treatment on your skin every day. Strixaderm's Crystal Peel Body Cleanser is a revolutionary in-home body wash gentle enough to be used on your skin daily, but potent enough to keep your skin looking radiant, firm, and glowing. For more details, just scroll down to our comprehensive review below. The exfoliating ingredients in Crystal Peel work both on the surface and deep within your skin to gently exfoliate the old, dead skin you don't want and reveal the new, glamorous skin below. Amber Powder + Passion Fruit Seed Powder: pulverized natural exfoliating particles which help to gently exfoliate away dead skin cells. Florapearls: tiny microspheres of jojoba oil to smooth and soothe exfoliated skin - almost like a full-body massage on a microscopic level. Glycolic Acid: helps purge your pores of skin-dulling pollutants such as dirt, oil, and old skin cells. Bromelain: this botanical is extracted from the fruit of the pineapple and reduces skin inflammation to make it look smoother and radiant. Salicylic Acid: a gentle chemical exfoliant, akin to aspirin, which encourages your body to produce new and healthy cells to keep skin looking fresh. Most beauty products can't promise such impressive results in a cream, a salon treatment, or even a chemical peel - but Crystal Peel is effective enough to provide these benefits with a simple daily body scrub! 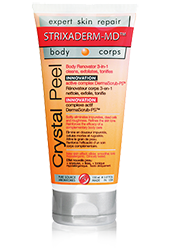 Interested parties can inquire about purchasing their own supply of Crystal Peel by visiting the Strixaderm.com website. Strixaderm is the manufacturer of this wonderful little body scrub, as well as a whole host of other impressive beauty products for your aesthetic regimen. New clients can enter a few simple payment and shipping details and get their body wash supply shipped to them quickly, with times varying by distance and shipping charges. If, for whatever reason, you don't experience salon-quality treatment results from using the wash, simply return any unused portion within the specified period of time to take advantage of the manufacturer's money-back guarantee. It is unlikely you will have to take advantage of the guarantee, though, because this scrub really does work. Its combination of gentle exfoliating agents work on both sides of your skin to give it a healthy complexion and a radiant glow. Click here to experience a new you by trying this fantastic body scrub today!